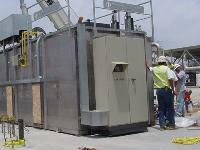 The TRITON™ Regenerative Thermal Oxidizer Made by Alliance Corp. 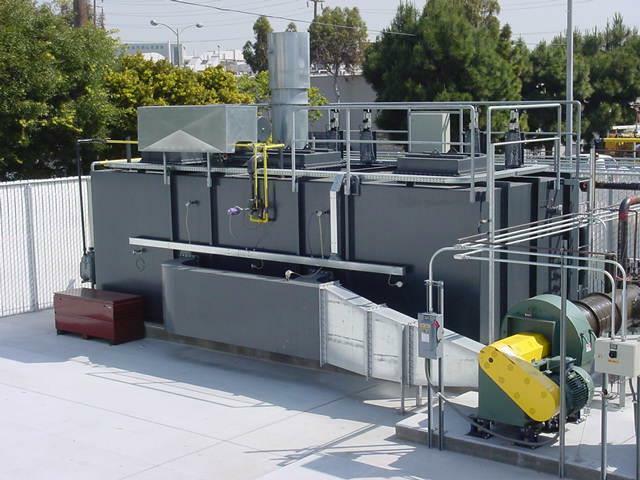 The TRITON™ Regenerative Thermal Oxidizer by Alliance Corporation represents the finest Regenerative Thermal Oxidizer available and our highest performance product. The TRITON™ fundamentally differs from the rest of the pack in that the TRITON™ includes 3 heat exchange beds in contrast to the 2-Bed design Regenerative Thermal Oxidizers emphasized by other manufacturers. The reason 2-Bed designs are popular is simple: 2-Bed Regenerative Thermal Oxidizers require less materials and are inherently less expensive to build. Click Here to see a gallery of TRITON™ images as they appear in the field. Our service engineers are standing by and ready to help. Click Here to request service. 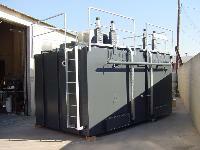 We service all brands of Regenerative Thermal Oxidizers. See our Complete List of Service Options. 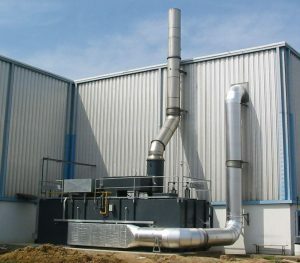 2-Bed Regenerative Thermal Oxidizers are perfectly suitable for many applications which is the reason that Alliance Corporation also offers 2-Bed Regenerative Thermal Oxidizers with our KRONUS™ product-line; however, where maximum performance is required, there are some drawbacks to consider for Regenerative Thermal Oxidizers with less than 3 beds. The TRITON™ Regenerative Thermal Oxidizer by Alliance Corporation offers the benefits of maximum destruction efficiency, high heat recovery, and process application flexibility of regenerative thermal oxidization designed in an economical modular package to create an outstanding overall value in high performance emissions control equipment. The TRITON™ is designed with integral valves to direct the flow through the heat exchange beds incorporated into the oxidizer body. The integral valves minimize the oxidizer footprint. 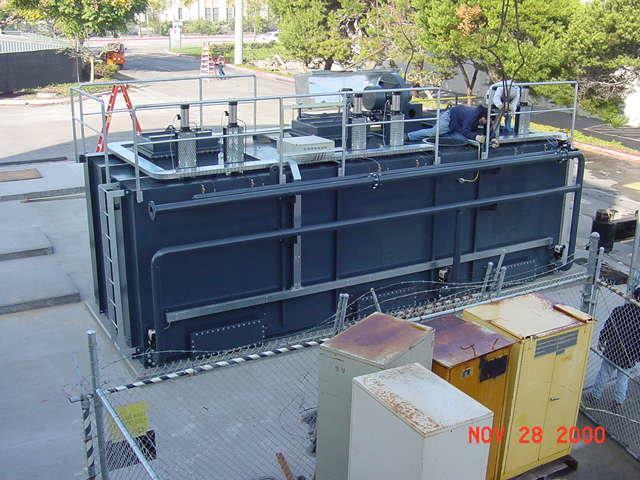 The entire oxidizer is housed in a single* compact box. This integral valve feature eliminates the transition ducts often associated with conventional Regenerative Thermal Oxidizer designs and further simplifies the field installation. 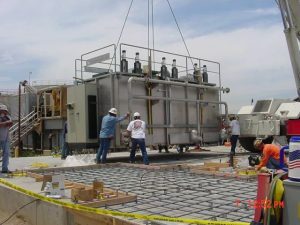 *TRITON™ Regenerative Thermal Oxidizer systems 12,000 SCFM and below are built as single contiguous pre-assembled modules. 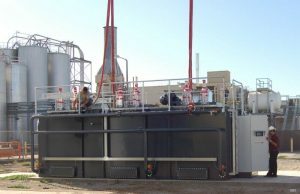 Larger TRITON™ Regenerative Thermal Oxidizer systems are comprised of multiple modules to accommodate conventional shipping. Each module includes a heat exchange bed, combustion chamber section, inlet and exhaust valves, burner, combustion air and gas train as appropriate. 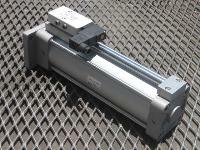 These modules are completely pre-assembled and shipped ready for installation. Regenerative Thermal Oxidizers are susceptible to vacuum spikes. By definition, it is the nature of all Regenerative Thermal Oxidizers to change the flow direction through the beds at regular intervals to exchange heat. 2-Bed Regenerative Thermal Oxidizers must internally reverse the flow between the two beds when the flow direction is changed. 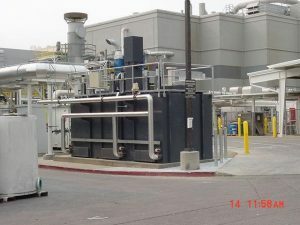 While most 2-Bed Regenerative Thermal Oxidizers attempt to reverse the flow reversal as quickly as possible, there is still a period of approximately one second when both inlet and exhaust ports to each bed are open and the untreated process is able to bypass the Regenerative Thermal Oxidizer. During this bypass period, the pressure drop of the beds is momentarily removed and the process fan which produces a constant differential pressure transfers the excess energy from the momentary loss of back pressure to the inlet duct-work in the form of a vacuum spike. 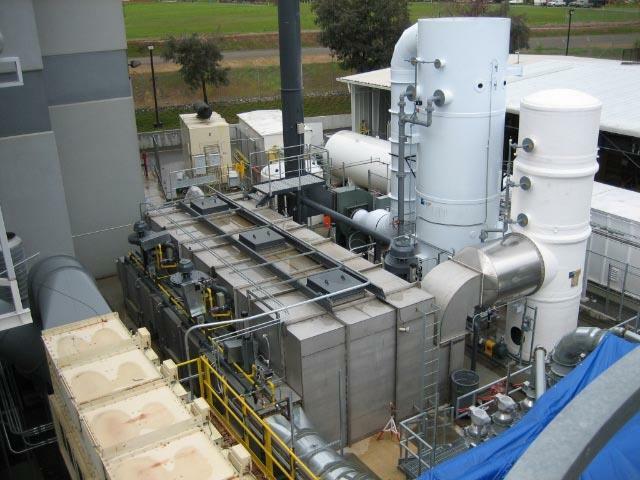 While it is often overlooked when selecting a Regenerative Thermal Oxidizer, the magnitude of the vacuum spike can be quite severe and wreak havoc on fragile processes such as web handling, semiconductor, etc. TRITON™ Regenerative Thermal Oxidizers differ with the availability of a 3rd bed. TRITON™ Regenerative Thermal Oxidizers do not reverse the flow internally, rather the flow is rotated through the beds. 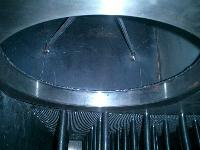 The rotation avoids opening the inlet and exhaust ports simultaneously. Therefore, the process is never bypassed and thus no appreciable vacuum spikes are created. VOC destruction is the measure by which an oxidizer destroys Volatile Organic Compounds (VOCs) exhausted from the process. 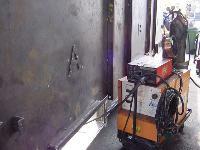 VOC destruction is the method to determine the caliber of an oxidizer. By the same means that a 2-Bed Regenerative Thermal Oxidizer bypasses the beds and generates vacuum spikes during flow reversals, untreated process is also allowed to bypass the Regenerative Thermal Oxidizer. The bypass flow combined with the entrained volume of the plenum and heat exchange media void space allows a significant spike of VOCs to escape to atmosphere untreated each time the flow is reversed. This VOC spike limits the 2-bed VOC destruction efficiency to around 95%2. Some applications can tolerate the lower VOC destruction efficiency of 2-Bed Regenerative Thermal Oxidizers; however, it is becoming increasingly common to require greater VOC destruction. In addition to VOC destruction, opacity is another factor to consider for processes containing condensable solvents, as when the VOC spike escapes it may be possible to see a puff of smoke leave the exhaust stack. To offset the VOC spike of 2-Bed Regenerative Thermal Oxidizers, some manufacturers utilize a downstream chamber with a diversion valve to capture the VOC spike. The captured VOC spike is then recycled back to the Regenerative Thermal Oxidizer inlet. Downstream chambers are limited since VOC spikes must be captured in motion. The VOC spikes are partially lost to the exhaust flow due to eddy currents, varying velocities, capture valve timing, etc. A capture chamber also adds back pressure to a 2-Bed Regenerative Thermal Oxidizer which requires increased process fan horsepower. 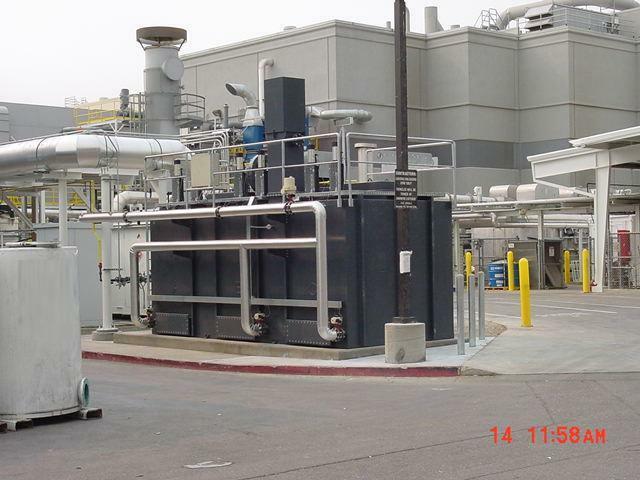 Just as the TRITON™ Regenerative Thermal Oxidizer avoids generating vacuum spikes by rotating the flow through the beds, the TRITON™ Regenerative Thermal Oxidizer also avoids VOC spikes. Additionally, the entrained volume is automatically contained in the off-line bed and is recycled back to the oxidizer inlet stream. 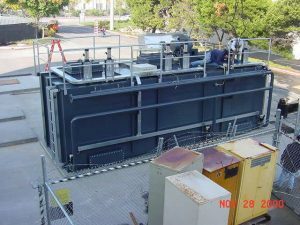 TRITON™ Regenerative Thermal Oxidizers are designed and guaranteed to destroy 99.0%** of the VOCs present in the process inlet stream to the Regenerative Thermal Oxidizer. 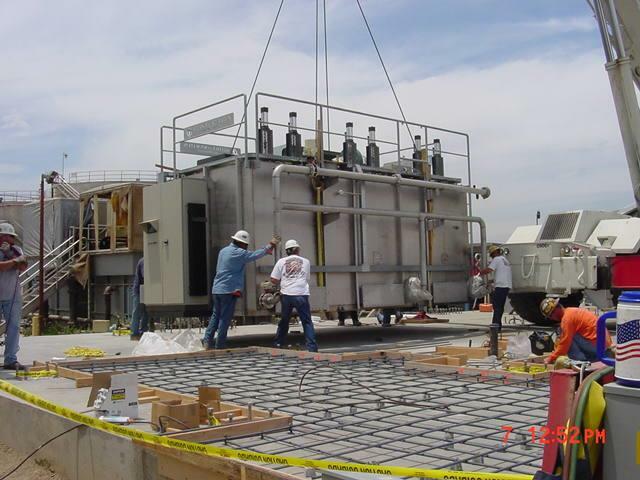 There are instances where TRITON™ Regenerative Thermal Oxidizers have achieved 99.6% VOC destruction in the field. TRITON™ 2-Bed Regenerative Thermal Oxidizers can be tuned by Alliance Corporation to enhance the VOC destruction up to a guaranteed to 98%**. ** If all of the Performance Conditions defined in the Proposal are satisfied, then the Regenerative Thermal Oxidizer will reduce the concentration of hydrocarbons measured at the exhaust as compared to the concentration of the inlet to the Regenerative Thermal Oxidizer by an average of greater than the stated percentage or down to 25 Parts Per Million Volume (PPMV) measured as C1 in the exhaust from the Regenerative Thermal Oxidizer. Please refer to the standard terms and conditions included with the Proposal for further detail. Our credo is that it takes 3 times longer to do anything in the field than is does in the shop. 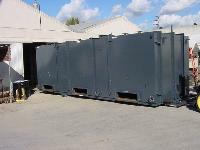 Therefore, all Alliance Corporation Regenerative Thermal Oxidizers are completely factory pre-assembled to the maximum extent possible. This includes mechanical assembly of all components and plumbing, and wiring of control cabinets, junction boxes and components. Every Alliance Regenerative Thermal Oxidizer undergoes extensive factory testing, control systems check out and calibration prior to shipment. The factory pre-assembly reduces the installation effort and maximizes quality control over the finished product. The factory testing ensures a smooth startup. 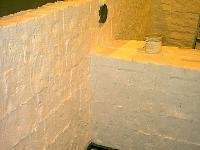 A typical installation can be completed in less than 2 days. A typical startup can be completed in as little as 2 days on-site, including personnel training. The controls, including the Variable Frequency Drive (VFD), are housed in a single climate controlled enclosure mounted on the Regenerative Thermal Oxidizer and factory wired to all of the components.d to all of the components.